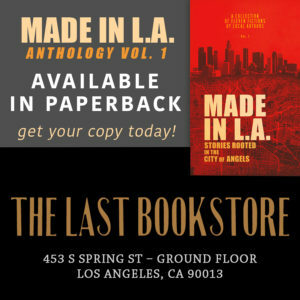 Anthology | Made in L.A. 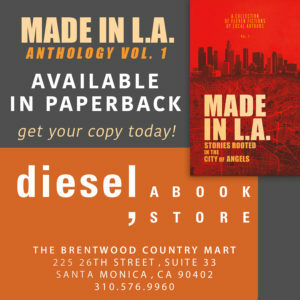 While Made in L.A. Volume 1 was rooted in Los Angeles, this volume focuses on goals, dreams, and the distant horizon. 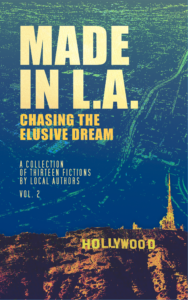 Chasing the Elusive Dream explores the fantasies people carry with them to L.A., as well as the dreams Angelenos dream while surrounded by this vast and evolving city. This anthology series showcases a diverse range of voices and genres. Like the City of Angels where these stories were born, nothing is off-limits. Literary or contemporary, fantasy or science fiction, each story in this volume invites you to view this urban landscape through a different lens. Made in L.A. 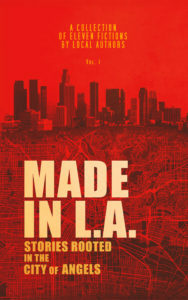 Writers came into being because local readers expressed their desire, en masse, for stories about Los Angeles. 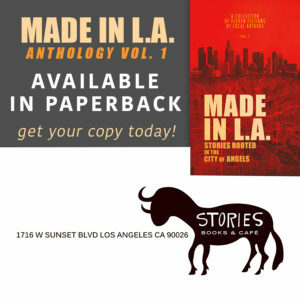 As a collaborative of Los Angeles-based writers who are dedicated to nurturing and promoting indie fiction, our work is both influenced and illuminated by our hometown and underpinned by the extraordinary, multifaceted, and often surreal culture and life in L.A.
A gangsta’s life is thrown off-course by a chance encounter with a mariachi. If you wanted to hustle, you had to sacrifice. When a whale’s songs come to haunt a teenage girl, she goes diving for answers. I live between heaven above and hell below. A deliveryman at the wrong address meets a woman who could brighten his life or ruin it. He felt like he was in a dream, cruising down the street in a fine car with a pretty girl. A retired icon reaches the breaking point, and his family suffers the consequences. There was a faint smile at the corner of his mouth, as if he had it all figured out. While discovering her own voice, a young woman has far more to learn than what’s on the syllabus. Girls like me didn’t end up with the lead singer. We ended up with posters of the lead singer. When a haunting face appears on a freeway overpass, a lonely young man slips into L.A.’s dark magical underbelly. We’d all learned in Romeo and Juliet that love unhinged. A day laborer survives a fall only to find himself stuck in a drug dealer’s den. I look into his still open eyes and answer the questions they ask. Yes, I’m going to help you. Yes, I’ll try to keep you alive. A waitress looks for fixes in all the wrong places. Have I ever been anything more than lowbrow gossip? An orphaned werewolf girl must face the true price of her freedom. I was a monster, one that should only exist on television or in films. Yet, there I was, on her doorstep. When it comes time to leave, goodbye is too good of a word for a toxic workplace. I’d never been so happy about that weird blue strip on my swipe card with CONTRACTOR in white font, all caps. A roadie junkie escapes to the desert and finds more than he ever expected. Of course one did not purchase anything at Burning Man. One acquired. It was spiritual. A printmaker’s wife imagines the dangers lurking in dark corners of L.A.
She soaked up the frisson of Los Angeles — a metropolis that really was as seedy and as noir as the films showed. Sara Chisolm was born and raised in the City of Angels. She still resides here with her two young children, who insist on being called by the weird pet names that their mother has bestowed upon them. When Sara isn’t teaching small children, she is chugging bubble tea or coffee while frequenting the cultural enclaves of her hometown. She is interested in learning about different cultures and languages. She lives by the mantra that “one more book isn’t enough books,” so she continues to buy more. She enjoys writing speculative fiction based in urban settings. Nick Duretta is a writer based in Pasadena, California. His career has encompassed a wide range of activities, from managing communication programs for Fortune 500 corporations to writing textbooks and screenplays. He has also conducted writing and oral presentation workshops and spoken at several international communication conferences. He is now focused on writing fiction. (His current project: a series of mystery novels.) When not hunched over his keyboard, he is out walking in the Southern California mountains and hills, enjoying his favorite pastime. James Ferry did his MFA at Goddard College, his MA at UMass, and he’s currently at URI, working on his PhD. His work has appeared in Academe Magazine, The Fiddleback, Pitkin Review, Heavy Feather Review, Citron Review, and the Hamilton Stone Review, among others. He currently teaches college English courses to male offenders preparing to reenter society. A lifelong itinerant bachelor, he remains, at forty-five, single and childless. Though little about him could be called permanent, he can always be found at www.swirlsinthenegativespace.com. Jude-Marie Green is a writer of genre (science fiction and fantasy, plus the occasional horror) fiction. She lives in Southern California amid palm trees, orange trees, avocado trees, roses, and birds. Lots of birds. She is a fan of long standing. Her first convention was in 1977 at the Los Angeles Airport Marriott. She attends many conventions, including NorWesCon in Seattle where she is frequently a panelist and professional author as part of the Fairwood Writers Workshop. Find her online at: judemarie.wordpress.com. 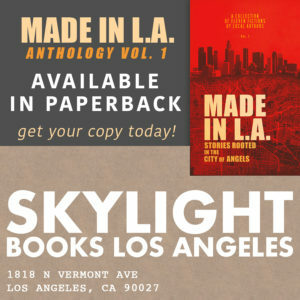 Nolan Knight is a fourth-generation Angeleno whose short fiction has been featured in various publications including Akashic Books, Thuglit, Crimespree Magazine, Shotgun Honey and Needle. He is a former staff writer for Los Angeles’ biggest music publication, the L.A. Record. His debut novel The Neon Lights Are Veins was published by 280 Steps in 2017. He currently resides in Long Beach. Peep more at NolanKnight.com. Gabi Lorino started off life as a Tampeño, but now that she’s reached the five-year mark in the City of Angels, she is officially an Angeleno. Finally, this place is starting to make sense! Ms. Lorino writes stories that feature socially awkward women who occasionally interact with men. Her tales are based on her 20+ years in the dating world and hilarious stories told by friends, sisters, and strangers in public places. Gabi is a proud member of Generation X, and she’s heard more than once that her characters “act a bit younger than they are” and maybe “need an attitude adjustment,” which makes her love them even more! Born and raised in France, Axel Milens is now a proud American writer, husband, and father. He lives in the Hollywood Hills with his wife, his four boys, and a dog named Maybe (finally, a girl). Axel is working on a collection of short stories about the brave and sometimes tragic souls who survive, love, and die under the Southern California sun. 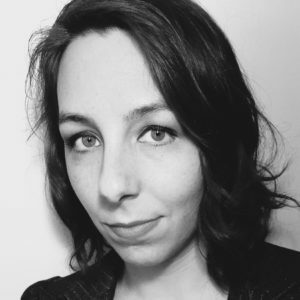 Allison Rose is a novelist and screenwriter from Los Angeles. Tick, the first in her young adult science fiction series, tackles themes of mental illness, artistry, and violence. It has been followed by Vice, part two of the Tick Series. While Allison’s stories vary in genre, her focus centers on the struggles of complex female characters. Cody Sisco is the author of speculative fiction that straddles the divide between plausible and extraordinary. His Resonant Earth Series includes two novels thus far, Broken Mirror and Tortured Echoes, and a short story prequel, Believe and Live. The third novel in the series, Altered Bodies, will be published in 2019. 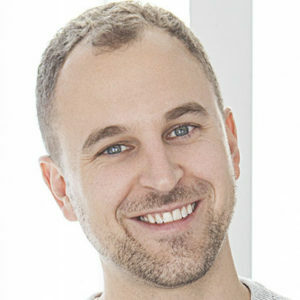 Cody is a 2017 Los Angeles Review of Books / USC Publishing Workshop Fellow. He is also a co-organizer of the Los Angeles Writers Critique Group. His startup, BookSwell, makes the book scene in L.A. easier to navigate, introduces readers to new writing, and weaves together digital and real-life literary experiences. Find out more at: www.bookswell.club. C. Gregory Thompson, a Pushcart Prize nominee, writes fiction, nonfiction, plays, and memoir. His work has appeared or is forthcoming in The Maine Review, STORGY Magazine, Writers Resist, Five:2:One, Cowboy Jamboree, Full Grown People, The Offbeat, Printers Row Journal, and Reunion: The Dallas Review. His work also appears in this anthology and Writers Resist: The Anthology 2018. He was named a finalist in the Tennessee Williams/New Orleans Literary Festival’s 2015 Fiction Contest. He earned an MFA in Creative Writing and Writing for the Performing Arts at the University of California, Riverside/Palm Desert. Find out more at: http://www.cgregorythompson.com. A.S. Youngless has been passionate about writing since her childhood. She runs the Graphic Novel Book Club for elementary school students in the hope of sharing her love of writing with the next generation. “For Hire” is her first published story. She lives in beautiful Los Angeles with her husband, son, cat, fish, and hermit crab named Spider. 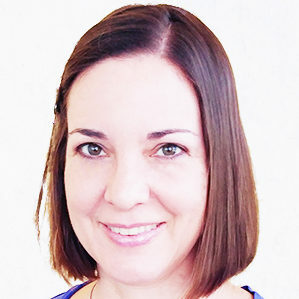 Abigail Walthausen lives in Los Angeles, where she writes and teaches. In 2017 four indie authors first came together under the Made in L.A. banner to support each other and share a booth at the Los Angeles Festival of Books. We passed out bookmarks, watched as kids made away with our candy, chatted with a few questionable characters, and found many new fans. We expected all of that. What surprised us was how many people approached our booth with a version of the question: Are these books all set in L.A.? Our reluctant though truthful response, “Not really,” didn’t satisfy them and it didn’t satisfy the four of us, who saw a missed opportunity to give them what they want. Four women are caught in the spotlight of a starlet with one last, dark performance up her sleeve. A weary job-hopper contemplates her future in L.A. when yet another contract ends. 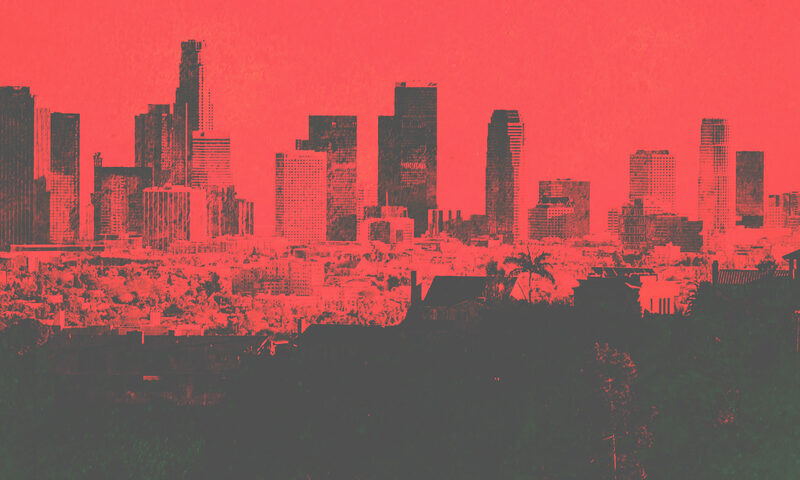 The demonic invasion of Los Angeles is underway and only a curanderx can stop it. Can a circus of genetic freaks care for the abandoned furry boy who shows up out of the blue? A workplace harassment incident has severe consequences when the victim shrinks to doll-size. A black writer visiting the Hollywood YMCA confronts his worst nightmare: a man with tiny hands. A hotel in downtown LA is the source and focal point for shattered dreams and too many deaths. Life lessons unfold for an old lady who thought she knew everything decades before. Stranded in Venice, an interplanetary visitor finds solace in surf rock until a stranger arrives. On a train in Highland Park, a dead man’s ghost bemoans his husband, his murderer.